I knew I was stranded at the Belvedere. From great heat to sudden rain, what to do? Stay a while longer with Klimt or venture outside and get wet? 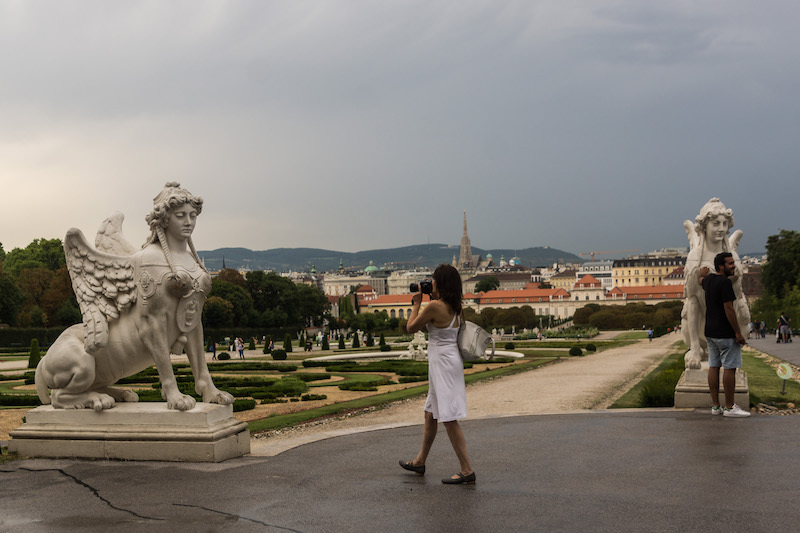 I had come to one of my favourite museums in Vienna, the Belvedere. 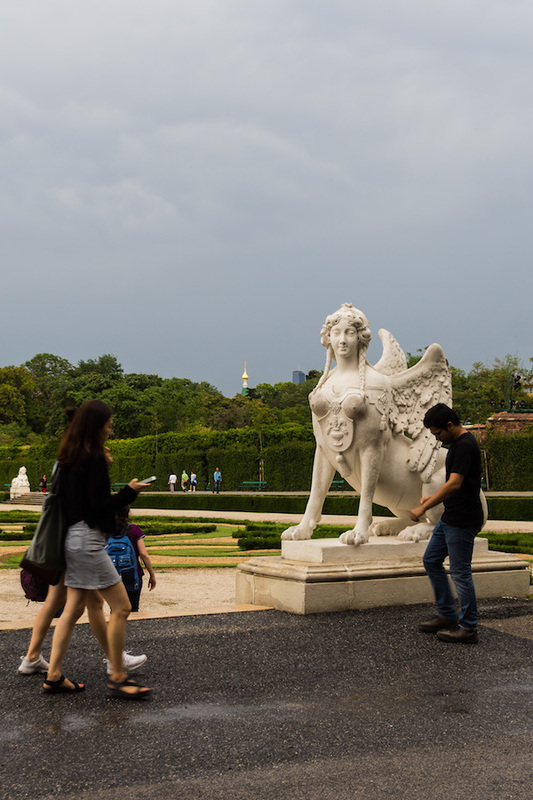 Built in the early 18th century, it is the work of the famous baroque architect Lucas von Hildebrandt and served as the summer residence of Prince Eugene of Savoy who died in 1736. 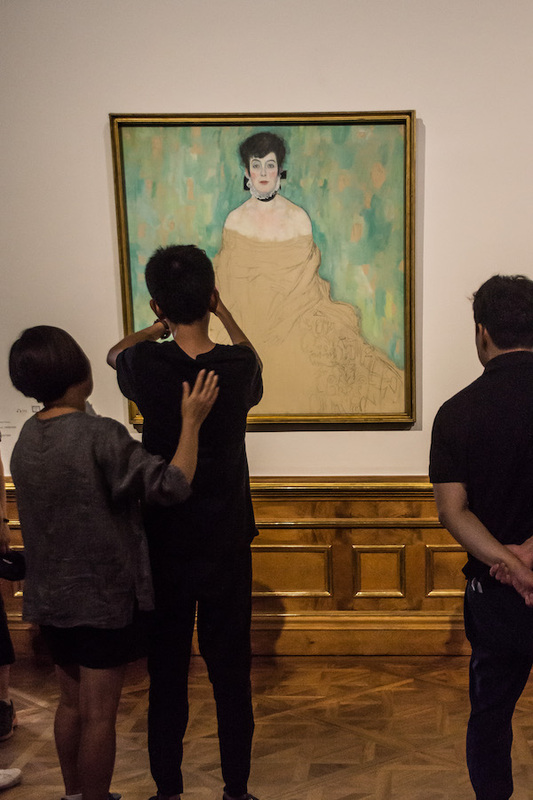 It still displays much of its beauty and happens to display some of my favourite painters’ artwork like Klimt and Schiele. Just a few minutes before I had been sitting in the restaurant outside, eating lunch. It was hot, a bit stuffy but I did not expect it to turn into a storm so soon. 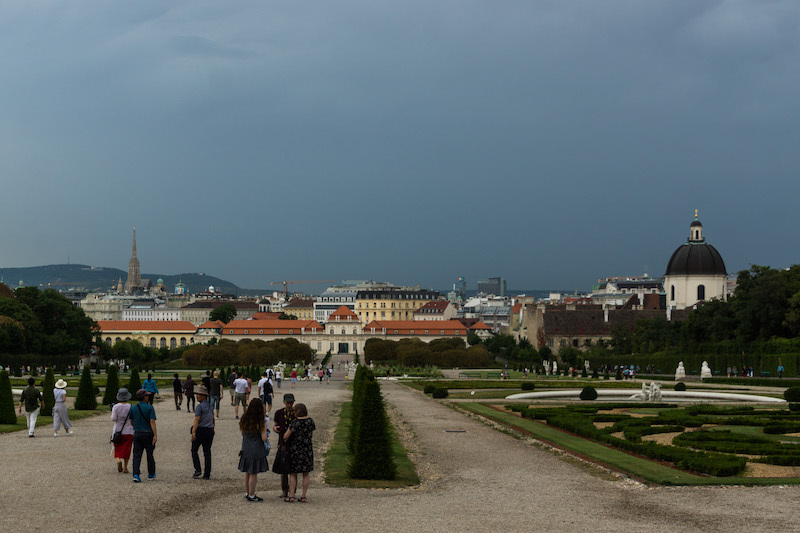 My idea had been to go inside, review a few of my favourite art pieces and then go to the lower Belvedere where I wanted to see an exhibition about Maria Theresa who was the only female ruler of the house of Habsburg from 1740 to 1780. To celebrate her 300th birthday, the Belvedere is presenting an Exhibition on her relationship with the Arts. When I was upstairs, I had briefly looked outside and although the weather seemed to be getting worse, It still looked fine. Suddenly I hear the sound of thunder and I knew rain would follow. I had no umbrella. I was stranded. I can’t explain why but my attention switched from the works to the people admiring them. But were they really admiring and paying attention? I had arrived at the Klimt rooms. 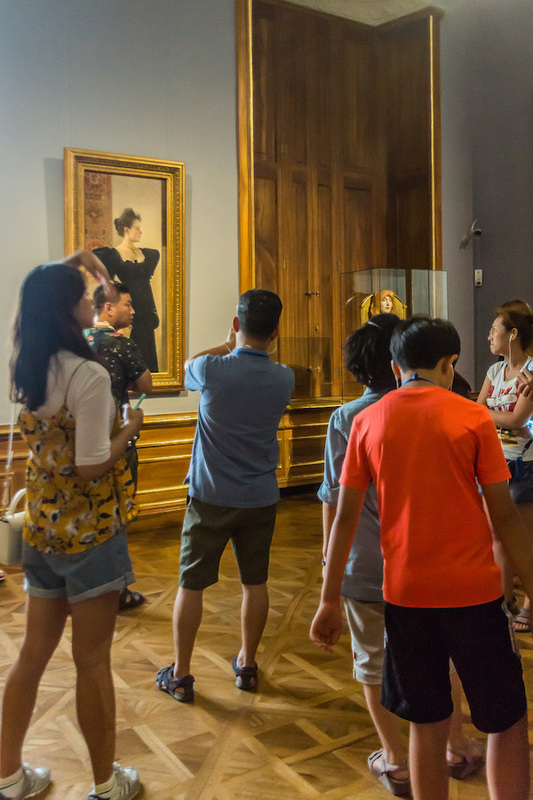 His “Portrait of a Woman” (1894) was surrounded by people but with the exception of the man taking a picture, nobody seemed to be paying any attention to it. The woman is looking away like she is waiting for someone or just lost in her thoughts. At least that is the impression she gives me. Art is subjective and it touches people in different ways. A woman standing to the side observes. Is she listening to the explanation of the guide in her ear or is she deep in her thoughts? There is a tension in her mouth and posture. She does not look happy. A man seems to be looking in the same direction as the woman in the portrait. Who or what is he looking at? I turn to Klimt’s unfinished portrait of Amalie Zuckerkandl dating from 1917-1918. There is a mother and a son in front of it. He is taking a picture. The mother affectionately touches his back. They look happy together. Happy probably to be travelling together. 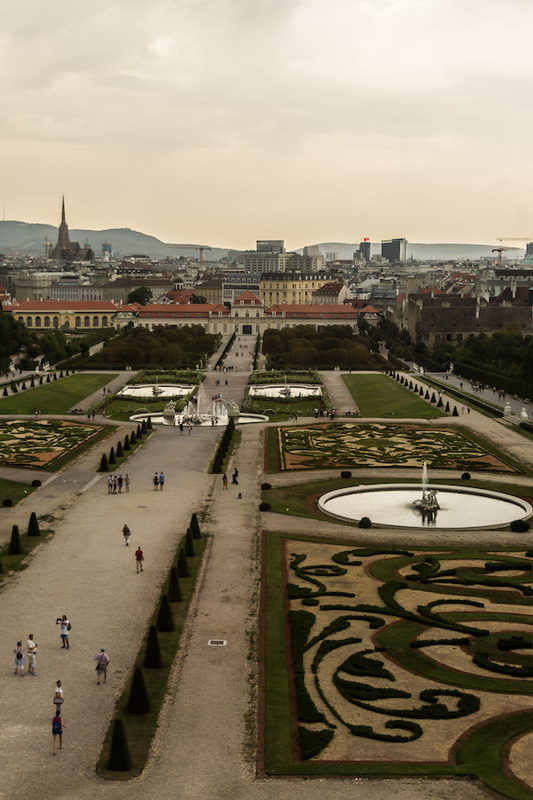 It could be their first time in Vienna and the Belvedere. It is touching and so appropriate in front of Amalie. I look into her intelligent eyes. To me there is a certain wit and strong character. Amalie was a Christian who had converted to Judaism to marry her surgeon Jewish husband, Otto Zuckerkandl. They divorced shortly after the end of the First World War. Unfortunately in the Second World War she and her daughter were sent by the nazis to the Belzec Extermination camp where they were both killed. I look again. I wonder how those eyes changed, when she faced death with her daughter by her side. Better not think about it. She stands as a reminder of what should not be forgotten. The mother and the son with their loving attitude brought her back to life. And then, there it is in all its glory, Klimt’s most famous painting “The Kiss”. It is also by far the most crowded. I’ve seen it many times but it always impresses me. Their embrace is total. The world around them has disappeared, only their love matters. Even their robes have become one. They are joined for eternity. I look at the people struggling to get near. Some push to get closer, to get the best angle. So many clicks. But then I notice a couple holding hands. 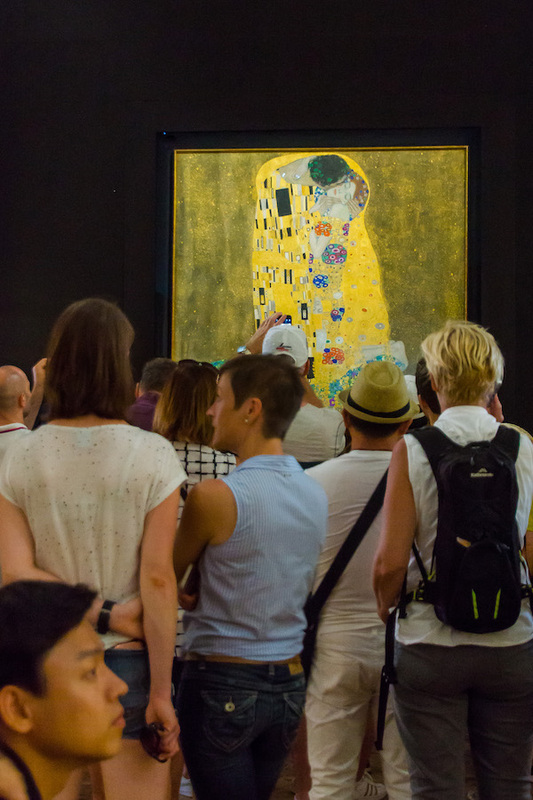 They seem as oblivious as Klimt’s couple, to all the fuss around the painting. They seem to be discussing the painting, looking lovingly into each other’s eyes. I could bet they are newly weds. I hear some muffled laughing, I look and to one side I see a group of teenage girls. They look at the painting and then across to the other side of the crowd. I follow their gaze. Ah, a group of teenage boys. How predictable. As I said, art is subjective and can inspire you in different ways. Then I see this man in the forefront. Oblivious is an understatement with him. He is completely in another realm. He seems to be looking at another painting. I admire his concentration. It takes a lot not to be drawn into this crowd. 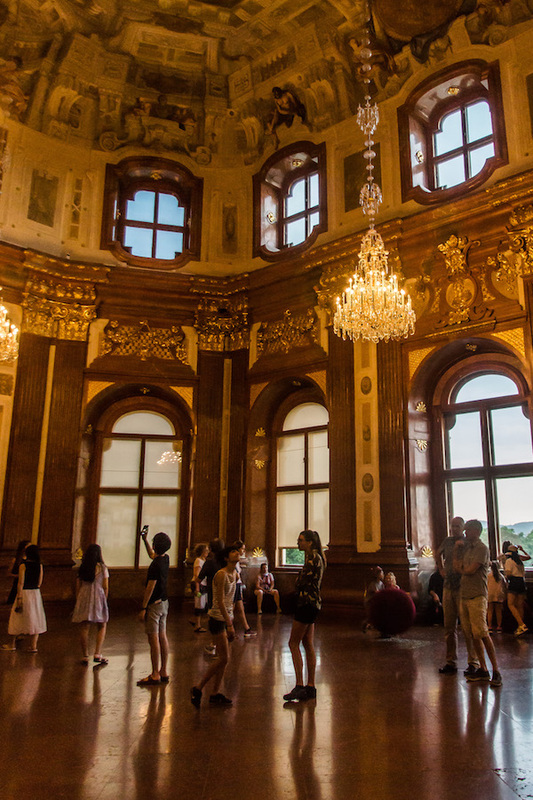 I move on from Klimt to other less crowded rooms of the Belvedere. I get to Napoleon and his victorious crossing of the Alps in 1800 to reconquer the Italian territories seized by the Austrians. After his victory, relations with the King of Spain Charles IV improved substantially. Diplomatic relations were restored and presents exchanged. Charles IV decided to commission this portrait of Napoleon to the painter Jacques-Louis David. The portrait was to hang in the Royal Palace in Madrid as a sign of the improved relations between the two countries. When Napoleon found out, he ordered the painter to do three more copies, two for France and one to be installed in Milan. Jacques-Louis David made a fifth copy for himself that he kept in his studio up to his death. 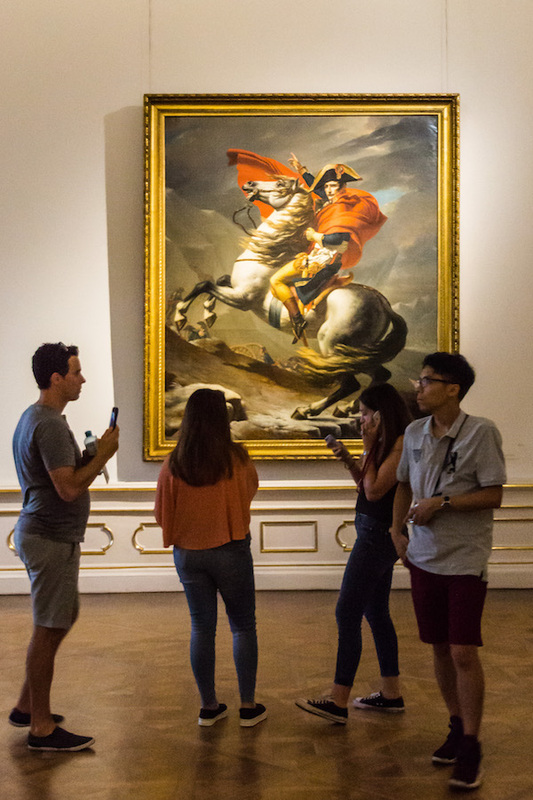 The painting that is in the Belvedere is not the original, that one sits at the Chateau de Malmaison. 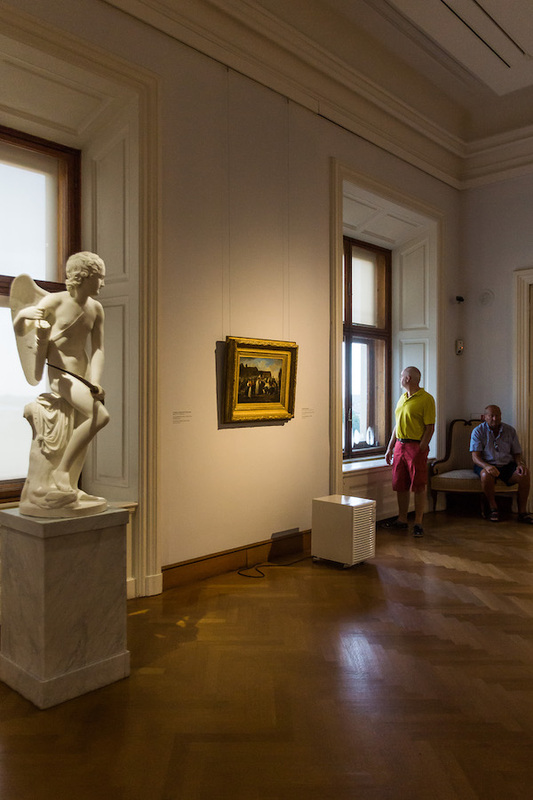 The one in the Belvedere painted in 1803 was confiscated from Milan by the Austrians. Napoleon actually refused to pose for the portraits. When the painter protested by explaining that resemblance to the original was important as people expected to be able to recognise Napoleon in the portraits, Napoleon dismissed it. He said that for him the most important thing was to show his character. From then on Napoleon’s portraits favoured more his idealised side than the physical one. So there he was, the hero showing his might on horseback, ready for victory. And what a contrast to the indifference displayed by the people around his portrait. It is like this scene portrays what happened years later in 1815 with the defeat at Waterloo and subsequent exile and death. Nobody seemed to care about him anymore. The French people that he claimed to have loved so much, had abandoned him. He had become invisible once again. And then I encountered Cupid. He seemed ready to shoot his arrows, but at whom? I looked and I only saw two men, one seated and the other standing by the window. The one seated looked tired, he seemed to be patiently waiting for someone. The one looking out the window had a more impatient posture. He was clearly hoping the weather would improve to get out of the museum. Suddenly two women come out of the previous room and joined them. They both smiled at them lovingly, I smiled too. These are the typical husbands that not necessarily enjoy visiting museums but they do it for their wives’ sake. Cupid was right to save his arrows. They don’t need it. I started making my way down. I had an engagement I needed to attend and I was running out of time. There were a lot of people still inside. 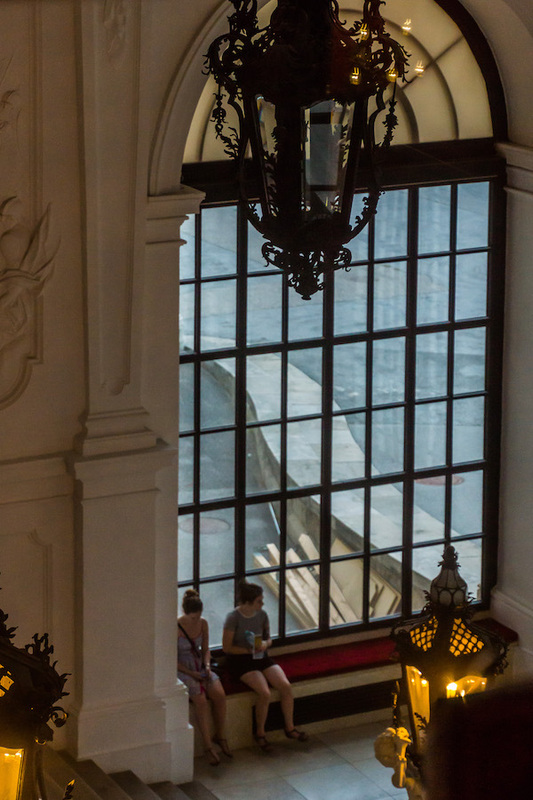 Some seemed to be making time, in the palace rooms of the Belvedere by admiring the decorative elements of the baroque style displayed. Others waited patiently in the sitting areas, catching up with their social profiles. I really needed to go. I looked outside, it seemed that it had stopped raining. It is still dark and wet everywhere. I’m hoping it will improve. More people are starting to venture outside. Even one of the sphinx in the garden seemed to be smiling, celebrating the end of the rain. Others seemed busy posing for pictures. I know I had to go. But there was something new in the gardens that I was curious about. As it is a temporary exhibit that will end September 10, this could be my last chance to see it. 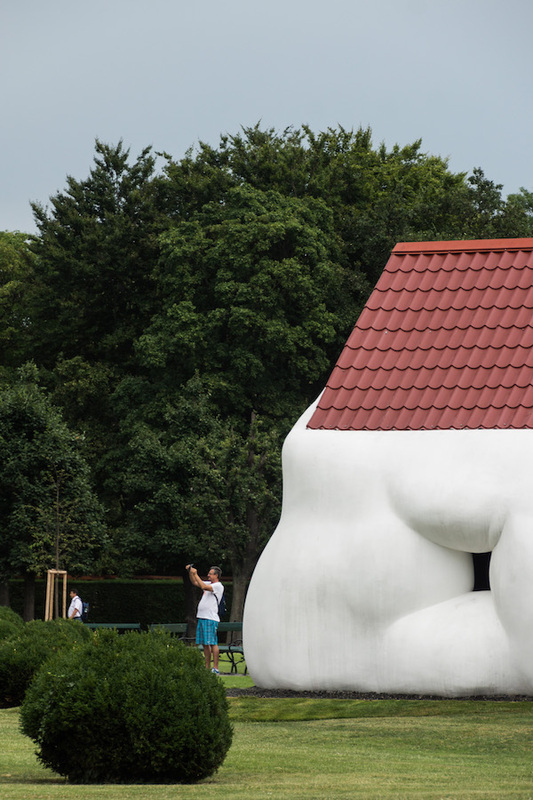 I’m referring to the sculpture of Erwin Wurm called the “Fat House”. With his “Fat” sculptures he displays middle class consumer goods in order to provoke a reaction regarding our consumer societies. 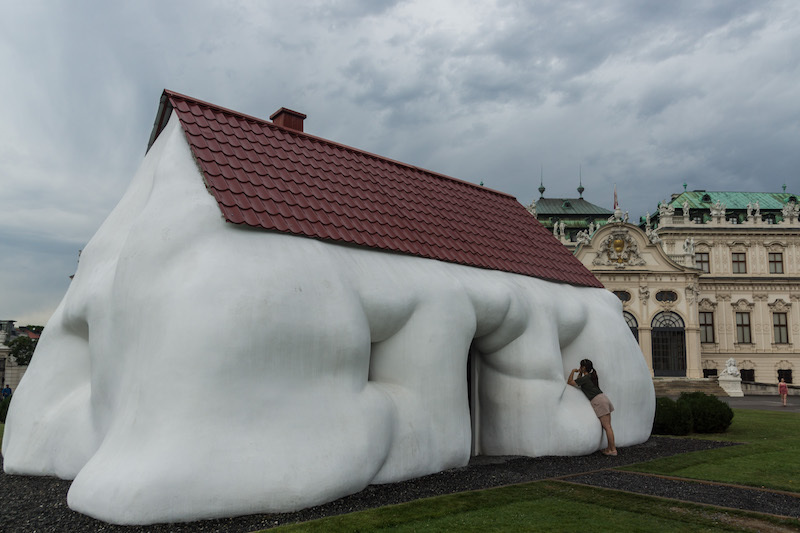 The house shows a video where the house is seen arguing with itself and posing existential questions to its visitors, like when is a house considered art and who decides about that? It was funny to see people’s reactions. That was it. No more time left. Stranded at the Belvedere no more. Such a shame. I quite enjoyed it. How many stories did I get right? I have no idea. And quite frankly it does not matter. It is wonderful to be free to make your own stories as you go along. If you want my advice, try to get stranded at the Belvedere, appreciate the art, make your own interpretations, enjoy! Ah and if you could lay off the phone while you are there, even better. I left the Belvedere a bit sad, months will go by until I have the opportunity to be back. What will I find? To know more and to find out what’s on, here is the link to the museum.